NEW BRITAIN - Although it’s still summer, the New Britain wrestling team already has its eyes on the future. Many of New Britain’s wrestlers have been putting in the work during this year’s offseason, including competing in the Nutmeg Games wrestling tournament. With over 150 participants registered, the Hurricanes entered 10 kids. Seeing such improvement from the wrestlers gives Jacquo a positive outlook for what’s to come this season. Jacquo appreciates the hard work the kids have been doing, along with their commitment to the sport. Having the Nutmeg Games in the summer gives wrestlers and opportunity to see how much they’ve grown since their season has ended. It also gives new wrestlers and opportunity to compete in a tournament setting for the first time. 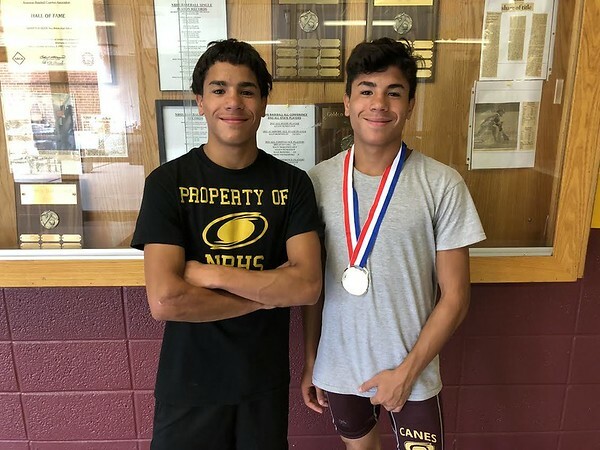 Twin brothers Isahus and Angel Maldonado are both rising seniors on New Britain’s wrestling team, however they are both in very different spots of their wrestling careers. Isahus has been wrestling for the last two years. Angel however, was just introduced to the sport of wrestling. Isahus and Jacquo are on the same page when it comes to the Hurricanes’ upcoming season. Isahus wants to end his high school career on a high note, hanging a Class LL banner in the gym. Other than wanting to be number in the CCC-West, Jacquo also wants to make top 10 in the state. Posted in New Britain Herald, New Britain on Sunday, 29 July 2018 21:19. Updated: Sunday, 29 July 2018 21:22.